KIDS 4 YEARS AND YOUNGER Free! Camp at Indian Trails and take a leisurely paddling trip down the Historic Fox River. Trips depart at Indian Trails where the Fox River meanders through the south end of the campground. 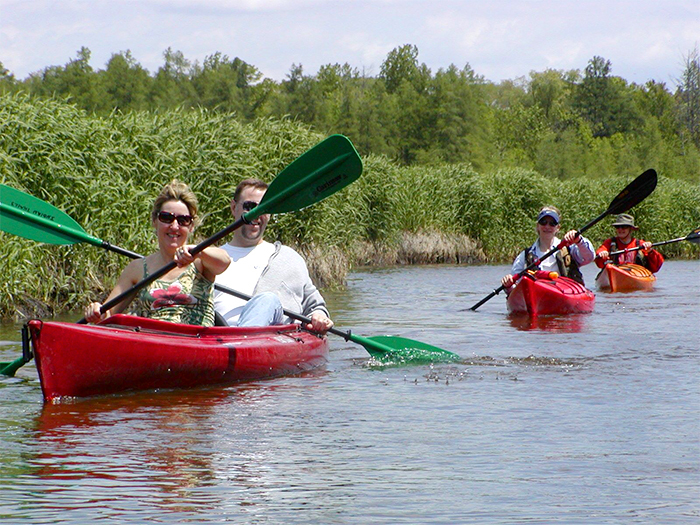 Paddle a canoe, solo kayak or tandem kayak on a 1 ½ – 2 hour trip to the DNR landing on the south shore of Swan Lake or a 3 – 4 hour trip to the spot near Portage where in 1673 explorers Jacques Marquette and Louis Joliet made the short portage from the Fox River to the Wisconsin River. The first trip (1.5-2 hours) meanders down the windy Fox River through wetland habitat, grasslands, backwaters, and some wooded shorelines. Enjoy great wildlife viewing and bird watching. Once you are on the river you are out “into the wild”. You may see sand hill cranes, blue heron, fish, deer, muskrat, beaver, turtles and watch for a pair of bald eagles as you enter Swan Lake. It’s a zoo out there!! You’ll navigate around and under a few fallen trees but will be able to paddle right on through. Stop on the sand bar and play for awhile where the Fox River spills into Swan Lake before making your way to the DNR landing on the south shore. The second trip includes the 1.5-2 hour trip above and then continues down the Fox River to the west end of Swan Lake, then onwards to either the wayside at Hwy 33 or 15 minutes further to where the Portage Canal meets the Fox River by the historic Indian Agency House. Take time to check out the birch bark and dug out canoes in the gift shop and tour the Indian Agency House before we pick you up. Admission is charged at the Agency House. This section of river is wider and has some great shallow sandy bottom stretches which make great spots to stop and play. No trees to worry about, just nice open paddling. It’s another wild stretch of river with very little civilization visible. The Shuttle service will bring you, your gear and boat, back to Indian Trails. It’s a great way to spend quality time with friends and family and get back to nature. Call ahead to reserve your paddling trip when you make your camping reservations. Book YOUR CAMPSITE OR CABIN today!